Sometimes having a car at Disney World makes sense. Sure Disney provides transportation, but what if you want to go off property? Or what if you prefer to know that at the end of a long day you'll always have a place to sit? 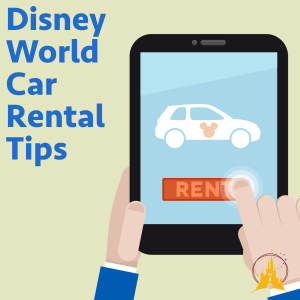 Whether you are a newbie or a seasoned traveler, we have some tips that we think can make a Disney World car rental work for you. There are many reasons you might consider renting a car at Disney World. If your vacation includes a trip to anywhere off property (like Universal, Kennedy Space Center, a beach, etc.) you'll need a way to get there. You can take Uber, a taxi, or shuttle service, but if you are planning multiple trips off property a rental car might be a better (and more economical) option. Having a car means you can cut down on food costs by eating a few meals at one of the many restaurants just outside of Disney's gates. If you didn't schedule a grocery delivery, having a car makes it easy to visit a grocery store where you can buy things like snacks and water to carry with you into the park. Sure the Disney buses are a great option, but when they are full you might find yourself standing. Having your own car means you always have a place to sit at the end of a long day. This is especially nice if you have young children. If you are flying into Orlando and you plan on driving for your entire trip, you will likely be renting a car at the airport. All of the big names in car rental agencies are found at Orlando International Airport (MCO). You'll also find several lesser known brands. Keep in mind that the lesser known brands may have better prices but they may not have the same resources available if you run into any issues. Because of that we recommend sticking with one of the major brands. Most major car rental companies offer car rental at Sanford. There is also a shuttle available to Discount Mobility for handicap-accessible vehicles. If you are only planning to use a car for part of your trip, it might make sense to rent from an agency near or on Disney property. Many people don't know that there is a full-service automotive facility right on Disney property. Located near the Transportation and Ticket Center, this is a very handy spot if you need your car repaired, some gas, or even roadside assistance. 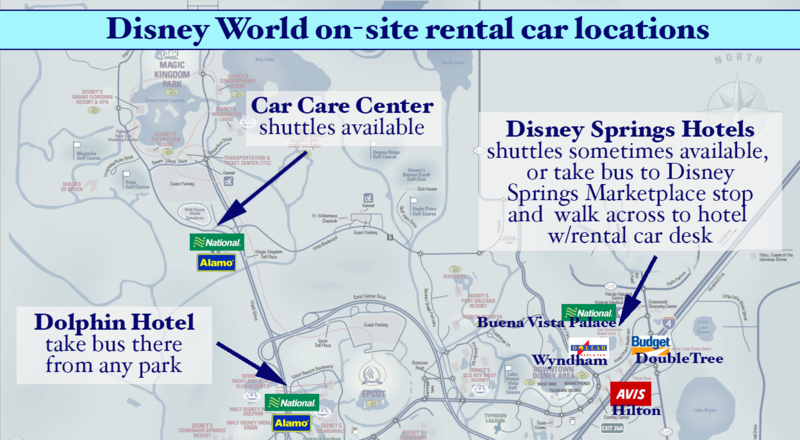 If staying on Disney property, complimentary shuttle service to and from the Car Care Center is provided. You can either be picked up and dropped off at your resort OR one of the theme parks. This location also offers an after-hours vehicle return if you need to drop off your car outside of their normal business hours. No shuttle is available after hours so you'd need to plan on using a service like Uber to get you where you need to be. If you are staying at either the Swan or Dolphin hotel (or the nearby Beach Club, Yacht Club, or Boardwalk Inn & Villas) this Alamo and National Car Rental location is very convenient. The hours at this location are shorter than those at the Car Care Center and prices can vary greatly. For the best deal be sure to price out this location compared to the others nearby. Available for military guests only, Shades of Green has an Alamo Rent a Car desk that is open for 4 hours every morning. Alamo Rent a Car does provide discounts for government and military personnel for both leisure and official travel so check on those before your book. 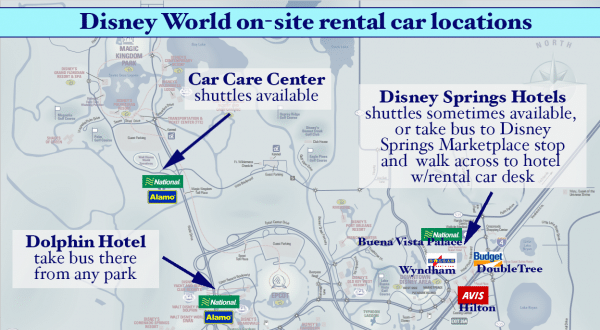 There are 4 resorts in or near the Disney Springs resort area that offer rental car services. Shuttles are sometimes available for these (call to inquire) or you can take a bus to Disney Springs and then walk over OR use an Uber/taxi to go directly to the hotel. Orlando has some of the best car rental prices anywhere. It isn’t hard to get a good deal. It just takes a little work. Want to get the best deal on your Disney World car rental? When renting a car, the best advice is to book a fully refundable fare (as far out as you can) when the cost fits your budget and then check back often to see if the prices drop. As long as your fare is refundable, you can cancel and re-book as many times as you’d like making it easy to snag the best price possible. Daily car rental prices tend to go down once you rent for a week. For the best deals make sure you compare prices between renting for a few days vs. a full week even if you only need the car for part of your trip. When looking for valid discount codes for a Disney World car rental, Mousesavers is a great resource. They always seem to have the best Orlando-specific codes for all the major rental car companies. You can find the list of current codes on their rental car discount code page. There are DISboards car rental watch threads for every month that are super handy. Consider signing in and subscribing to the threads for your travel month so you'll be notified of new posts. If you're a Costco member, be sure to check the Costco discount rental car codes for prices. Discounts are available for Alamo, Avis, Budget, and Enterprise. And with the Costco Alamo code, you get an additional driver for free. Autoslash is a handy (and free) resource for tracking your car rental for price drops. In some instances it can even automatically re-book your reservation for you. We've had mixed results with having our reservations automatically re-booked for us, but since the Autoslash service is free to use we think it is worth it to check it out. This site often has prices that are hard to beat. Be sure to check Hotwire car rentals as you compare prices. If you are driving from home to Walt Disney World, you have probably already mapped out your route. 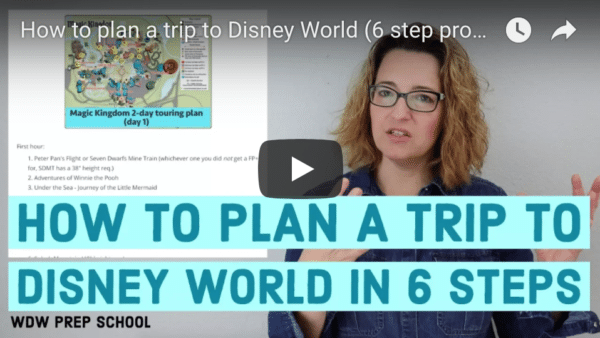 For those flying into Orlando, you may not have thought much about getting from the airport to the Walt Disney World Resort, which is roughly 30 minutes away. 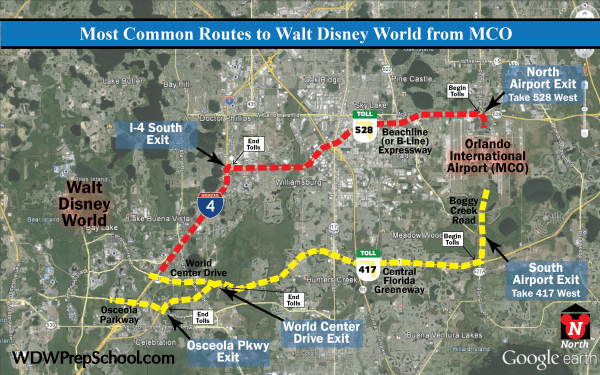 There are 2 main ways to get from MCO to Walt Disney World. There are other routes that may have you avoiding toll roads, but these roads will also be more congested and more likely to have construction issues. If you are first-time driver (or an infrequent driver) in Orlando, I recommend you stick with the toll roads. It is well worth the few dollars to avoid the traffic. Pro: Cheaper. You'll pay less in tolls. Con: Often more congested and you have to connect to I-4. Pro: Less traffic. You'll avoid the I-4 congestion. Con: More expensive. You'll pay slightly more in tolls. 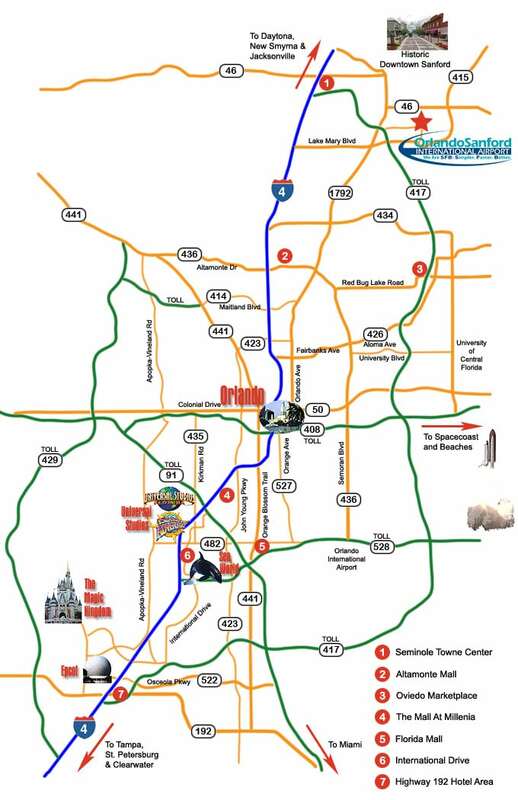 To get from Sanford to Disney World, you'll either need to take I-4 or the tollway. 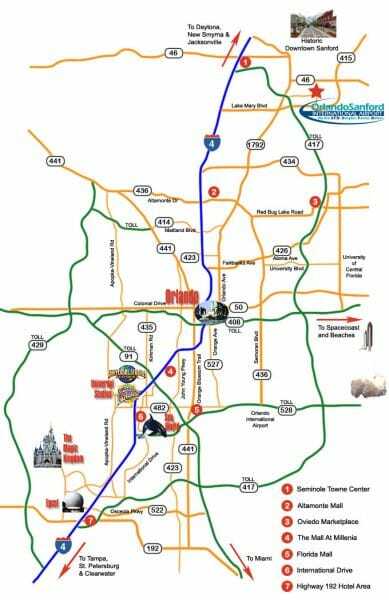 Like the 2 Disney World routes, you'll have to choose between congestion on I-4 and save on tolls, or you can choose the tollway which will be less traffic but cost a bit of money. If driving to or around the Walt Disney World resort you can anticipate coming across toll roads. 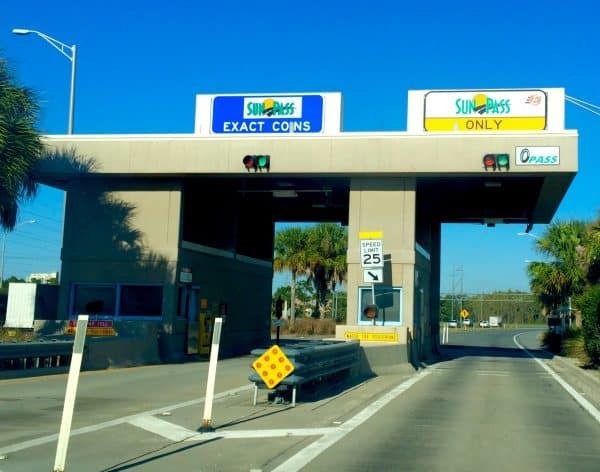 The toll roads around Disney World use the SunPass system and many are unmanned and offer only an "Express Lane" and an "Exact Coin" lane. To use the Express Lanes you will need your own SunPass transponder. SunPass transponders can be purchased in Florida at many places including CVS and Publix. 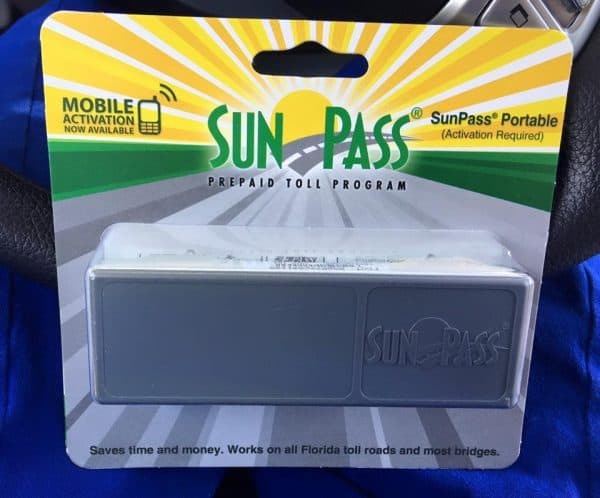 SunPass transponders can also be purchased online. If you are driving your own car and you have a transponder for the turnpike system in your area, make sure you check to see if your local toll system works with SunPass. Most visitors will pay their tolls as they go and should be prepared with adequate and exact change. Roughly speaking, it will likely cost about $3-4 in tolls each way. We recommend that you bring with you $8-$10 worth of quarters to cover this cost. Just to be sure, you can use the toll rate calculator to figure out how much you can expect to pay in tolls. Most of the rental car agencies offer a “deal” in which they will let you use their SunPass transponder for a daily fee. In most cases you are charged the daily fee every day of your rental in addition to the cost of the tolls. The fees vary from $3.95 per day all the way up to $10.49 per day. 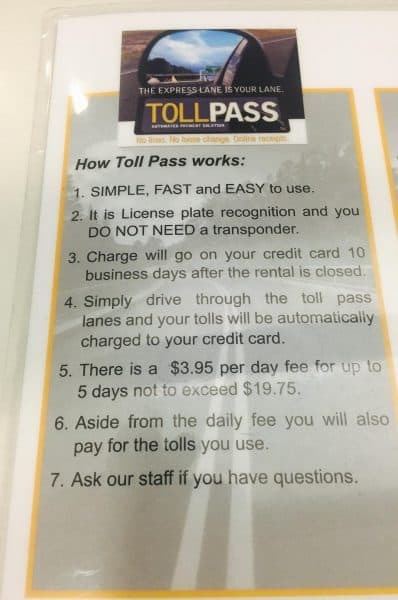 Considering the cost of the tolls is around $3.00 to $4.00 each way, you can see that their “deal” could wind up being a huge expense for you. To compare the fees that each agency charges you can visit the SunPass website. There have been recent reports of price gouging at some of the gas stations closest to the airport. When refilling your tank before your return flight home, we suggest that you use an app like GasBuddy (iOS and Android) or Gas Guru (iOS and Android). Using an app like that will ensure that you find the best price on your route to the airport. If you plan to exit the tollway, be sure you plan ahead and have enough change for your tolls. If you know you'll have a rental car during your trip, you'll also probably want info on how to use it once you're at Disney World. 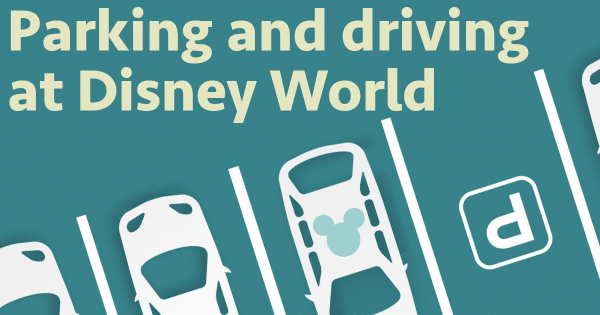 Check out our guide to parking and driving at Disney World for all the details. Have any tips for a Disney World car rental? Tell us about it in the comments below.